The best I could think to do was make a figure that is connected, hole-free, and has a rotationally symmetrical pattern of connections between blocks. I had hoped to make them into a geomagic square, but now I’m pessimistic about that working. And the trick from my magic 45-ominoes of making all rows and columns have the same number of cells in polyominoes won’t work here because the total number in each row of 3×3 blocks is 22, which isn’t divisible by 3. 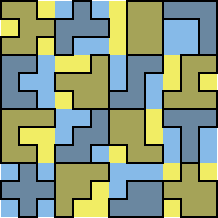 Because the X pentomino has only one possible predecessor or successor, it cannot be part of a cycle, but it is still possible to make a path through all of these pentominoes and hexominoes with the X as one of its endpoints. Here’s another idea: since the pieces have total area 88, they might fit in an 11*11 square with eight unit squares to a row/column (and maybe diagonal). This might work similarly in a 22*22 square (not necessarily connected) or a 22*11 rectangle (ignoring diagonals).